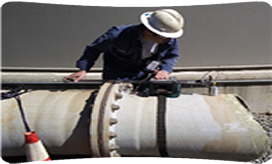 Spectrum provides Nondestructive Testing, Pipeline Integrity Programs, Non-Metallic Testing and many related services. Over three decades we have earned a reputation for technical expertise, advanced technology and steadfast work ethic. Spectrum is the source for equipment, training and services. "The service, reliability, and knowledge that Spectrum NDT provides is always 110%." "Spectrum always provides knowledgeable, timely, and honest service." © Spectrum NDT USA Inc. All Rights Reserved.